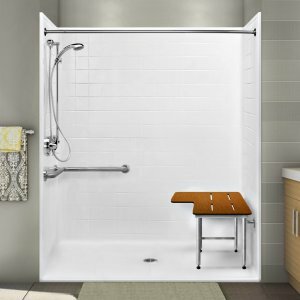 Handicapped adaptable showers are designed for wheelchair access and easy entry. Non-skid textured bottom surfaces are standard with reinforced sides and backs for handrails and seats, meeting ANSI ICC A117.1-2009 (Section 609). Seats and grab bars are available options. Handicap Shower Stall 45"x50"x78" Tile Walls Barrier Free w/center drain. Wheelchair Accessible. 4" Removable rigid fiberglass composite threshold. Shower Pan PR 64 1/4" X 44 3/4", 3 1/2 wall.